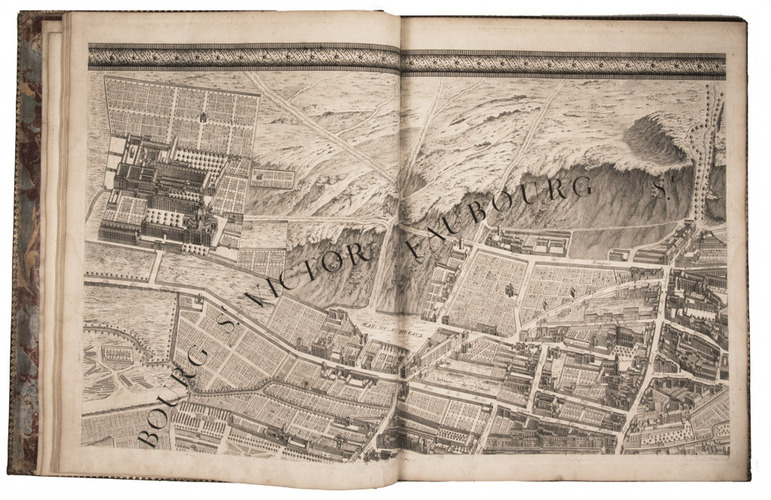 Plan de Paris commencé l'année 1734. Dessiné et gravé, sous les ordres de Messire Michel Etienne Turgot, Marquis de Sousmons ... Achevé de graver en 1739. [Paris], . 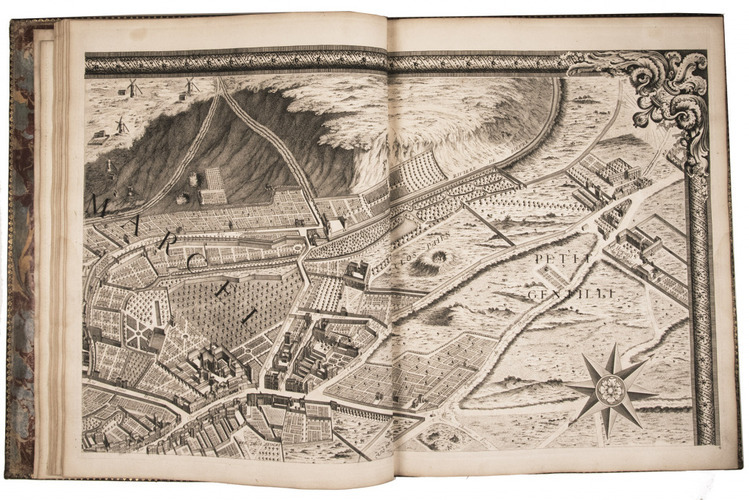 Grand-Aigle folio (56 x 45.5 cm). 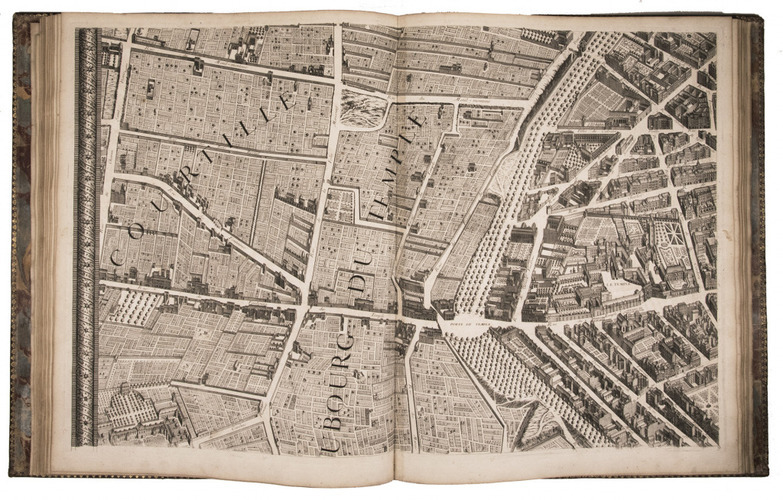 An enormous engraved map of Paris in 20 numbered sheets plus a key map, at a scale of about 1:2000, each segment measuring 55 x 84 cm (plate size 51.5 x 80.5 cm; image 48 x 79 cm) which would give an assembled map with image size about 240 x 316 cm! The key map is slightly larger than the segments and folds out at the head. Bound as an atlas (but with segments 18 and 19, containing the cartouche, assembled to make a long fold-out) in contemporary gold-tooled red morocco, each board with as centrepiece the Paris coat of arms (a ship with chief a field of fleurs-de-lis). 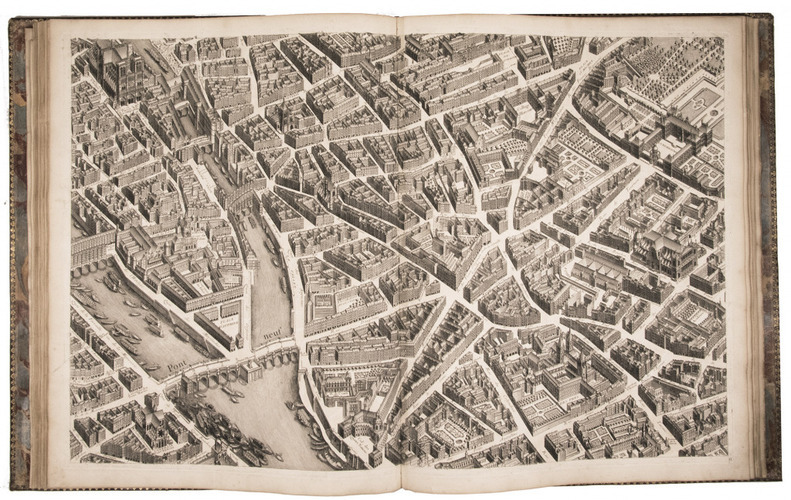 An extraordinary engraved map of Paris and surroundings in 20 enormous sheets, showing the city and its buildings in a bird's-eye view (the buildings in an orthographic projection, nearly isometric, but mostly from a slightly higher angle, around 45°). 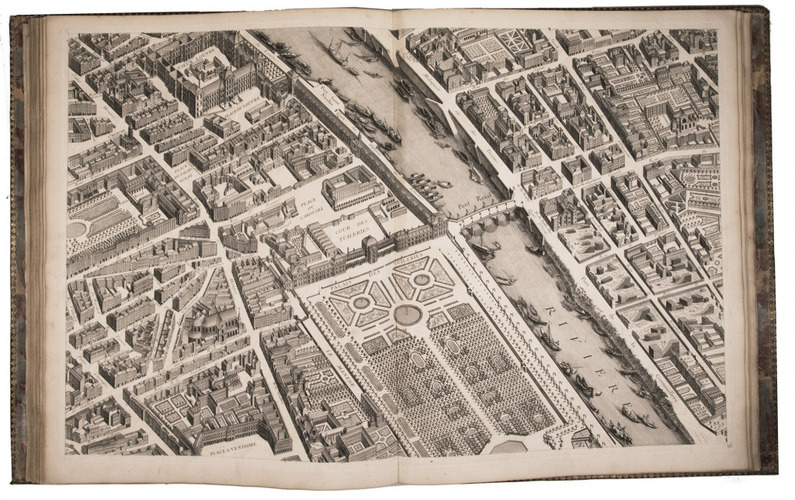 It covers the area within about 3 kilometres of the centre of Paris at a scale of about 1:2000, showing every house and every other building in great detail with windows and doors, as well as the layout of gardens, parks and orchards, boats in and beside the rivers, and in the surrounding countryside also topographic features. 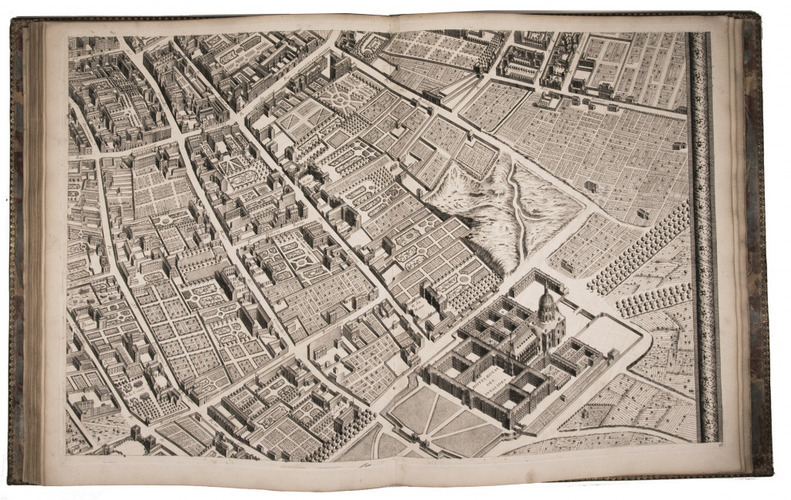 No map gives a clearer idea of what Paris looked like ca. 1740. Michel Étienne Turgot (1690-1751), "prévôt des marchands" of Paris (more or less the mayor) and one of the most powerful men in France, ordered its production, which occupied the years 1734 to 1739. 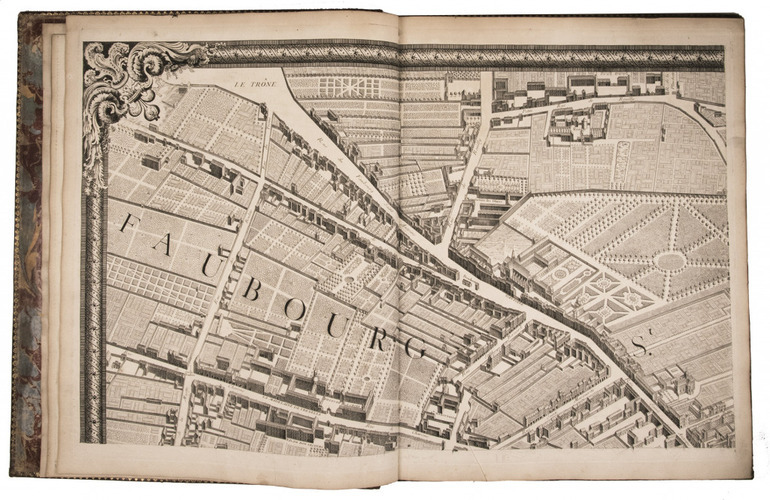 It was surveyed and drawn by Louis Bretez, engraved by Claude Lucas, and the lettering executed by "Aubin". 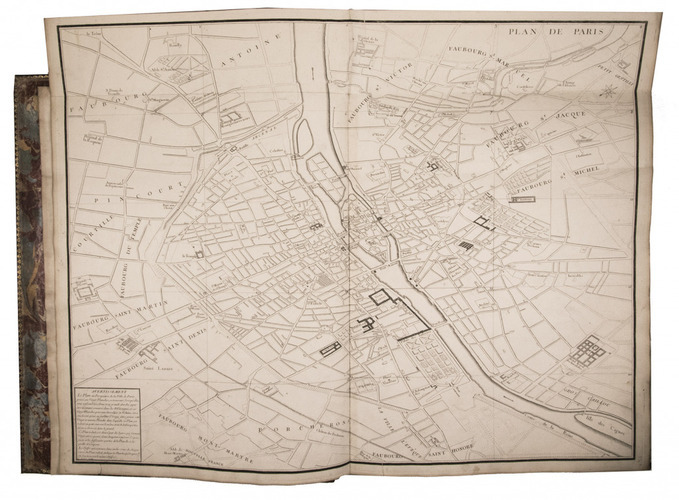 A note on the key map indicates the main map was sold both assembled as a wall map and bound in segments as an atlas. 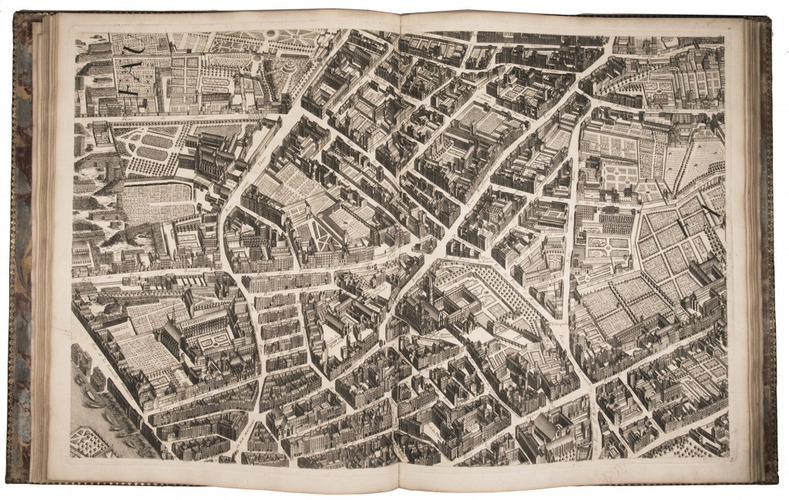 It served both practical aims as a reliable guide to the city and showed off the city's glory. 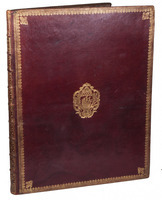 The present copy, in its splendid gold-tooled red morocco binding with the Paris coat of arms and the extensive use of French lilies, certainly appears to have been intended as a presentation copy that the city might give to influential people or honoured visitors, but it contains no record of its provenance. Cohen & De Ricci notes that copies in red morocco "de Padeloup" (perhaps merely meaning in the general style associated with Antoine Michel Padeloup, royal binder from 1733) are known with either the arms of Paris or the royal arms. 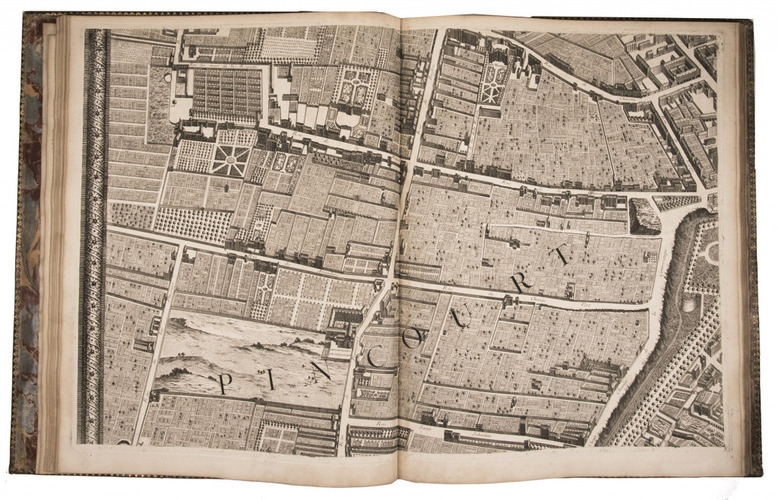 With an occasional small tear, 3 entering 1 to 3 cm into the map image, but all sheets in very good condition. The binding shows minor damage at the corners and slight wear to the hinges, but is also very good. 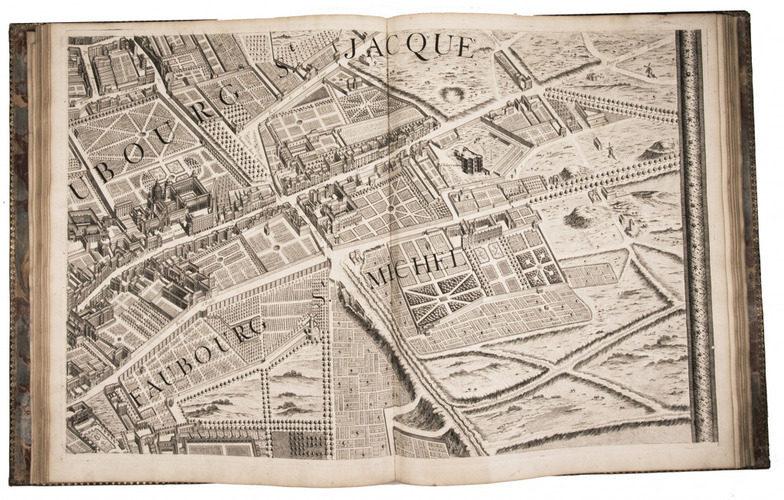 A remarkably well-preserved copy of the most magnificent map of Paris. 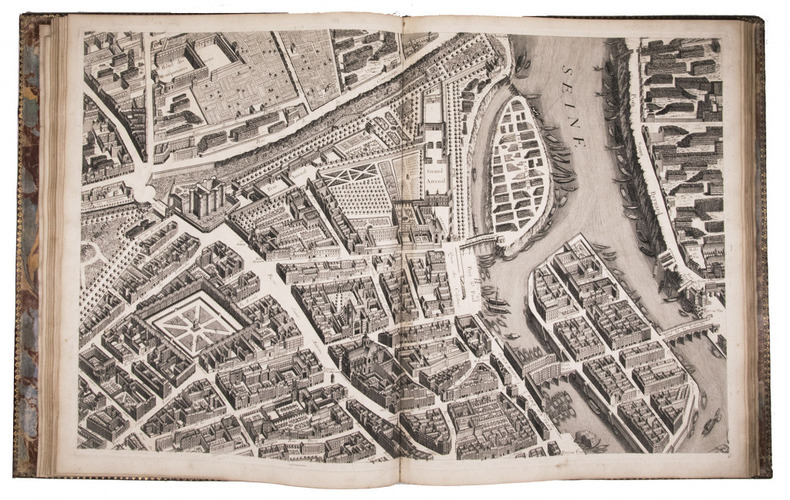 BMC maps 3, col. 306; Cohen & De Ricci, p. 807; IKAR (2 copies); for the Paris arms: Olivier 2121 no. 3.